For fans of animation, especially shorts, this was a bountiful year, Pixar nailed it with two shorts this year: the Toy Story-themed Partysaurus Rex and the visually stunning La Luna, which captured an Oscar earlier this year. Fox hit us with a Maggie Simpson short, The Simpsons: The Longest Daycare, and the Cartoon Brew animation blog really became an invaluable resource, notably its annual Student Animation Festival, which had more than 200 entries in 2012, one of which is featured on my list below. 21 Years in 7 Minutes, Caroline Torres (Cartoon Brew) Almost all of the animated shorts I’ve watched this year fit into the category of animated film, as if there were more inherent merit in that than in cartooning, so I appreciate the fact that Torres went straight for the cartoon jugular in laying bare the peculiarities of her life story (so far). By being so personal and so funny about it, she ends up making an animated film anyway. One Day, De Joël Corcia, Bung Nguyen, Thomas Reteuna, Laurent Rossi, Bernard Som (Gobelins) In this lonely piece of fiction, a man lives in a house that is unstuck in time, keeping its foundation in place only one day before picking up and disappearing into another time and place altogether. When it lands in a modern city, a cup of coffee could change everything. The possibilities are endless with this concept (as with all time travelers), and it’s a shame they had to whittle it down to one story, but they chose a great one. 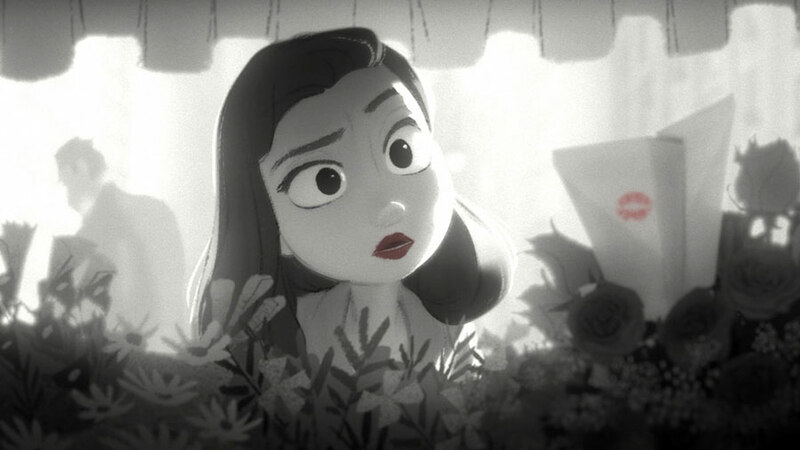 Paperman, John Kahrs (now playing with Wreck-It Ralph) Though I chose to do this list alphabetically, Paperman is one of the best films I’ve seen in years of any genre, length or artistic discipline. The film adheres to the Disney style of magic, employing the paper airplanes in the same tone that Mickey did 50 years ago with his enchanted brooms, while also forging new ground stylistically with its brilliant multi-layered mottled ink-and-paint style. I can’t speak highly enough of this film. Patton Oswalt’s Magical Black Man, Dan Henrick (AV Club) You could argue that Oswalt’s storytelling is the driving force behind this short, but the purposely crude animation serves this story unbelievably well as Patton has a life-altering meeting with a polite magical black man, changing the course of his comedy forever. Sundays at Rocco’s, the Rauch brothers (StoryCorps) This is a sweet, heartbreaking story of immigration, eminent domain and Sunday supper – but above all, family and the sadness that comes as we drift apart. When outlaw ninja bikers and a gang of street toughs land in Orlando to push their coke trade on the streets and rock clubs of our fair city, there’s only one thing that can stand in their way: a band of taekwondo black belt musicians (and UCF undergrads) called Dragon Sound, led by Grandmaster Y.K. Kim. Miami Connection, an incredibly strange film that feels something like The Way of the Dragon meets the movie-within-a-movie from Pee Wee’s Big Adventure, had been buried in obscurity for almost 25 years, after a disappointing initial release that barely made it past local screenings for friends and family. After being screened unseen on a whim at the Alamo Drafthouse in Austin recently, the film has been reborn in the mold of countless midnight cult classics. It has become something of a feel-good story for the wary Kim, who still operates the Orlando-based Martial Arts World taekwondo schools and does motivational speaking tours around the country. 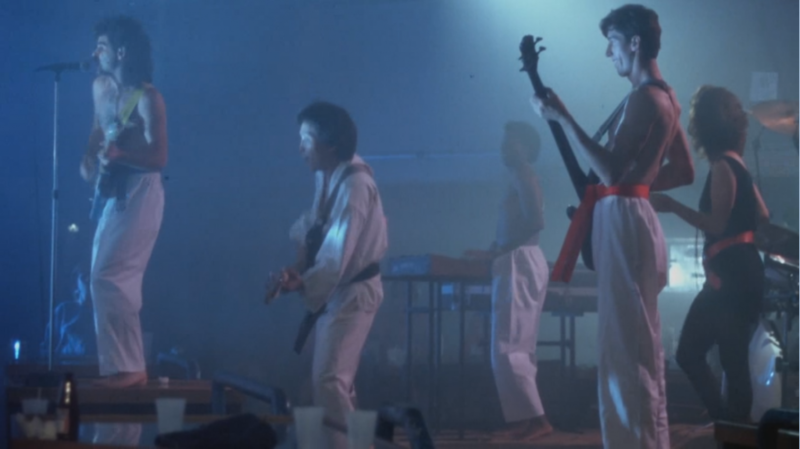 Dragon Sound, the happy-go-lucky band at the heart of the film, are a seven-piece pure ’80s synth-fusion group that rocks out with subversive lyrics like, “Friends through eternity/Loyalty, honestly/We’ll stay together through thick or thin.” If the band is at the heart of the film, the sentiment in those lyrics is at the heart of the band, a group of black-belt orphans searching for rock’s inner peace, harmony and their lost fathers. As we first meet them, they’ve taken over as the house band at the Park Avenue nightclub, once Orlando’s hottest hangout. The aforementioned street toughs are not happy about this development, because Dragon Sound is a threat to the club’s thriving drug trade. It’s never really made clear why they’re such a threat, and much of the band’s feud with this mafia collective stems from the fact that the leader of the street toughs, Jeff (William Eagle), is pissed that his sister, Jane (Kathy Collier), is one of Dragon Sound’s singers and that she’s dating the bass player, John (Vincent Hirsch), leading to rock ’em, sock ’em martial arts battles in the streets for the victim soul of Orlando. I feel conflicted about using the word “good” to describe the film, especially when the word “infectious” fits it so much better. It’s actually hard not to like a film made with such earnest, honest intentions, even though it’s plain to see why it was dismissed when it first came out. It’s rough – very rough. It makes you appreciate why Jackie Chan films shoot at such a slow rate of footage per day. But films on that end of the quality scale usually have a make-a-buck cynicism to them that sticks out like a scab embedded into the film grain. They make us keep our guard up. But if you approach Miami Connection in the spirit in which it was intended (and with a few beers), it feels honest – it defies our mad cultural obsession with consuming everything with a damning ironic appreciation. Dragon Sound attacks us with the same wave of constantly cheery, smiling optimism that we find in dance troupes like the Rockettes, or the Beijing Olympics opening ceremony. That’s something I can find time for these days.